A mesh network is a configuration wherein all of the devices in a connected network communicate with each other directly. It does not rely on a central hub or router to achieve this feat; and instead the nodes act as routers for each other when passing data around (called hopping). One of the greatest advantages of using this type of network is that it’s self-healing and self-configuring. In the event a node fails, another one will take its place. Furthermore, the range of the system is virtually endless- as long as the components are within the desired proximity where they can communicate and exchange data. Extending the network is as simple as adding another unit to the configuration. Communication is two-way, which allows data to travel in the most efficient path to its destination. In light synchronizing systems, mesh networks offer low cost solutions for complex configurations. Businesses will not need to invest in a main control hub, and since the system is wireless, control wires are not needed. The network is robustly flexible as well. Bulbs can be installed in hard-to-reach or confined spaces where wiring is not an option. Changing a lighting arrangement and its color-changing features is done through simple software reconfigurations. Because mesh networks are highly scalable, individuals may use the grouping method for multi-room and multi-floor lighting installations. A new trend in mesh networking involves the incorporation of Bluetooth technology and smartphone apps to control the bulbs (change colors, brightness levels, light modes and third-party integration) in the network. An example of the low-power technology in action includes the installation of multiple RGB color-changing bulbs in two rooms (respectively R1 and R2). Both rooms have several light bulbs installed that are on a single mesh network. A light switch in R1 can be used to turn on, or change the color, of bulbs in R2- and vice versa. When the switch in R1 is turned on, data from the switch travels to every bulb, until it reaches its destination, which in this case are bulbs in R2. The process of sending data to every device in the mesh network is called flooding, while choosing a specific path for the information to travel is called routing. Flooding is considered to be the more energy efficient option, compared to routing, because less memory and processing power is needed to accomplish reliable data communication. Another option for synchronizing colors in RGB bulbs is a Wi-Fi system. In such configurations, 2.4ghz refers to the broadcast frequency of the waves being used by the wireless devices. When unobstructed, the mainstream frequency is equipped to handle long range using small antennas. According to the Federal Communications Commission, it is also unlicensed, which allows manufacturers of wireless devices to incorporate the band with minimal barriers. Routers are the main hub for this type of system. All of the RGB bulbs are connected to the router or a zone receiving controller. Individuals may control the lights using a mobile app or a remote. A zone receiving controller is applied when scaling the system to multi-rooms or multi-floors. By incorporating such components, a facility can support two or more groups of lights with the same remote. In the case of two rooms, R1 could be using one zone controller to group one set of bulbs, while R2 may use its own zone controller for its own set of bulbs in the area. Both controllers are connected to a single router, and a remote (tablet, smartphone or third-party remote) can be used to communicate with both zone controllers. Most Wi-Fi lighting systems offer functional controls, such as color temperature adjusting, dimming and programmable color profiles. For those who already have Wi-Fi setup in their home or office, this light control option is easy to install. It does not affect internet access, and pushing control to other users is as simple as installing an app or purchasing another remote. Compared to mesh networks, this configuration requires an assortment of components to work together, increasing the possibility of encountering maintenance and reliability issues over time. It is important to consider that due its strong reliance on Wi-Fi for data communication between various system components, walls and other solid obstructions may decrease its broadcasting efficiency. For outdoor, open environments, such lighting systems are very effective. Track style control systems make use of long strips for high-intensity lighting solutions. Each strip can include multiple RGB bulbs to create a seamless mixture of blended color. Such systems are used in confined spaces or as edge lighting. They can be tucked away in wall indentions, behind large furniture or interior lining or borders. Alternatively, a track can be used as a foundation for large lamps. All of the fixtures are connected to each other via the track, and the whole system can be installed on ceilings to provide downward lighting. Compared to the two lighting configurations above, track style controls do not offer wireless bulb-to-bulb connection, but a wireless remote can be incorporated to control the lights from a distance. Most systems use a wall panel or a switch that is directly connected to the strip for control and synchronization. During installation, individuals may connect multiple strips or tracks together using a connector when scaling the system to meet the needs of large facilities. An advantage of track style systems is solid functionality. One does not need to worry about wireless-related issues; and because all of the lights are directly connected to each other, risks related to failure are minimized. 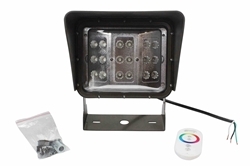 When it comes to application, some may find installation options limited, because the lights are forced to remain on the track or strip.